What Makes for a Good Restaurant Review? After my recent entry about Quince restaurant in Bangkok, Nathanael (NVPhotography) asked my advice on writing restaurant reviews, since a local paper had asked him to review on new restaurant in town. Never having given it much thought, I asked for a few days to consider my response. Let me say that I don’t consider most of my entries about restaurants to be true reviews. I just share some pictures of the food and offer some comments. A proper review is more in depth and thoughtful than my musings normally are. That said, let me share five thoughts about what makes for a good restaurant review. 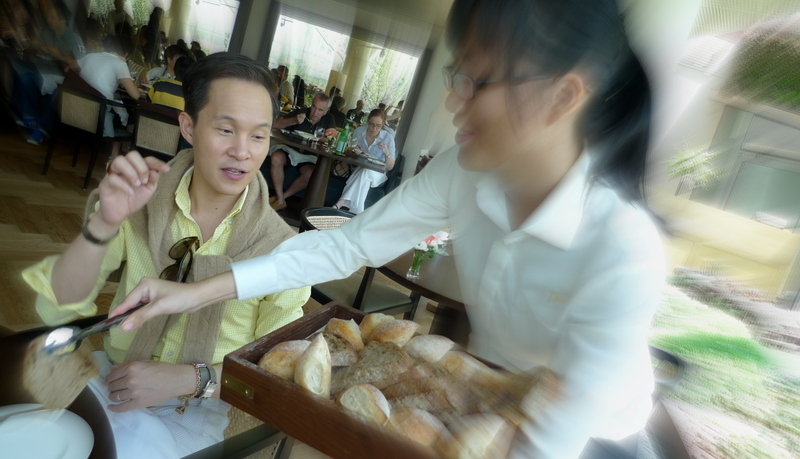 Tawn selects bread at Pollen restaurant at Gardens by the Bay in Singapore. First, have no conflicts of interest. You cannot offer an objective review if you have been paid by the restaurant, have received any complimentary dishes, or have any financial stake in the restaurant. It is customary for some restaurants to send an amuse bouche, a tiny bite before you dine, to whet your appetite. This does not count as a complimentary dish, as it is given to all diners. Second, provide a context. This means explaining a bit of the history of the restaurant and/or the background of the chef. Now, this may be more applicable to a higher-end restaurant than to a local diner, but even in the later case, the fact that it is a local diner owned by a family of Greek vegetarians might help us understand what they are trying to accomplish. Think of it this way: when you watch a local high school drama department’s production of “Anything Goes,” you have very different expectations than when seeing the debut of a new opera by a professional company. Third, explore the menu, especially specials. A good reviewer will either dine with a group or will return to the restaurant several times, in order to sample a wide range of dishes. It isn’t just the number of dishes that is important, though. What also matters is the type of dishes. If a chef is known for his charcuterie (prepared meats) then be sure to order the tripe, the head cheese, and the blood sausage. If the restaurant specializes in seafood, order a lot of fish and not much steak. Most of all, be sure to try any specials. These are meant to reflect the chef’s talent and creativity, often using seasonal ingredients. This gives the restaurant a chance to shine in the area they claim to be their best. Fourth, be fair in your review. Everyone has their bad days and your dining experience can be influenced by factors that are out of the control of the chef or the restaurant staff. A table of rowdy drunks may ruin the ambience, but it isn’t fair to criticize the restaurant for their behavior. Even poor service from a waiter should be put into context. If possible, make a follow-up visit to see whether the poor service persists or was possibly unusual. Finally, when you write, try to be as specific as possible. Instead of simply saying that a dish was good, try to explain what you enjoyed about it. This fifth point has helped me pay more attention and be more thoughtful when I eat. When I think about the flavors and notice how they contrast or complement each other, I get more out of the dining experience. If you can convey that thoughtfulness in your review, your readers will get more out of the review. Of course, I’m sure that if we poked around in my previous entries about restaurants, we could find plenty of times when I’ve broken one or more of these guidelines. As they say, do as I say, not as I do! What are your thoughts about what makes a good restaurant review? This entry was posted in Uncategorized and tagged Dining, food, Restaurant, Review, Writing by christao408. Bookmark the permalink. I feel that is an excellent list of how to review a restaurant. Not sure what I would add. I think the first point is very crucial. A lot of the professional bloggers often receive free samples and whatnot. Great list to follow. But, your reviews, though not professional in your opinion, are great in and of themselves. I think you critique them so well. What I post is hardly a review except to give a thumbs up or down… and I’m not as picky or decerning as a true reviewer would be. hehe! I do love your posts – I learn something every time! Exactly what you said. When someone asks me where is a good place to go eat here where I live, I always rec “The One Eyed Crab”.The food is wonderful and they have a large variety with a menu for meat lovers and vegetarians.The service is great and the atmosphere is warm and friendly.It is clean and has a wonderful fragrance that is not over whelming.The ac in the summer time is not to cold, and the heat in the winter is not to hot.The tinted, large windows look out over the ocean and the docks, so the view is peaceful and calming.This is my fav spot to go out for any meal and their fresh crab, cheddar cheese omelette is amazing. These are all good suggestions, Chris — I think, too, that the best reviews are honest about why one should try (or not) the restaurant. Great advice, and the attention to both detail and the entire process of how the dining experience should be is useful in other fields, as well. This is great! I was going to start writing restaurants reviews, and this has been really helpful. This is fantastic advice!! I will be sure to keep these points in mind when I review restaurants in the future! Yelp here I come! That’s pretty good advice and that’s why I always enjoy reading your reviews.